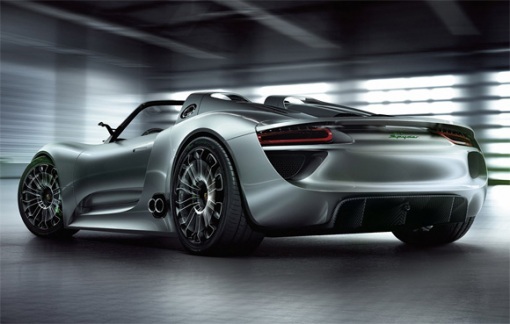 Porsche 918 Spyder – The Future of Performance? Woah. If last weeks release of the Porsche GT3 Hybrid wasn’t enough to tickle your ‘mean and green’ fancy, the feast your eyes on this. The Porsche 918 Spyder Hybrid. Yes, another hybrid from Porsche, only this time it’s the plug-in variety (amongst other cool features). The Porsche 918 Spyder is as mean as it looks. All in this thing puts out 718HP – 500HP from a traditional V8 and another 218HP from a pair of electric motors mounted to each axle. Top speed sits right below 200MPH and 0-60 is in the 3.2 second range. Oh, and it can go 16 miles on electricity along and average 78MPG if you don’t have such a heavy foot. So how does it do it? Well, first off the engines can run independently from one another or in tandem, and there are foru different ‘modes’ which dictate the pace. Hybrid – Internal combustion and electric motors for around town. Race Hybrid – All out. Additionally, there is a ‘push-to-pass’ button, not unlike what’s been rumored on the next gen M5. This along with the rest of the system we are assuming relies on KERS (Kenetic Energy Recovery System) as seen in past posts and in the current seasons F1 cars.